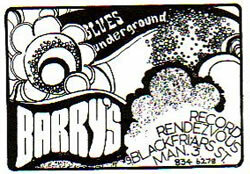 I worked next door to Barry's, at a small advertising agency called Davis Advertising during 1967-1968.It was great being able to slip next door during the lunch break and shift through the hundreds of 45's and albums they had in stock as well as listen to & the latest albums booming out in the store. They changed the window display every week, and it was always an exciting to have a look at the new stock (an imports) in the window. They had a good stock of soul, jazz and the latest underground' releases - I well remember staring at the debut Santana release and trying to work out the design, and pondering wether to really buy Zappa's Lumpy Gravy and Rueben And The Jets albums on the meagre wages to hand. Comment: Tony Burke. Tony Burke Sound of the world forum and Manchester Beat.